The HET was designed and constructed with a unique objective: to gather a very large amount of light, specifically for spectroscopy, at extremely low cost. A fixed elevation-axis design, based on the radio telescope at Arecibo, and an innovative system for tracking stars, contributed to an 80% reduction in initial costs compared to optical telescopes of similar size. The primary mirror of the HET is the largest yet constructed, at 11.1 x 9.8 meters. At any given time during observations, only a portion of the mirror is utilized. The HET’s 10 meter effective aperture places it among the world’s five largest telescopes. 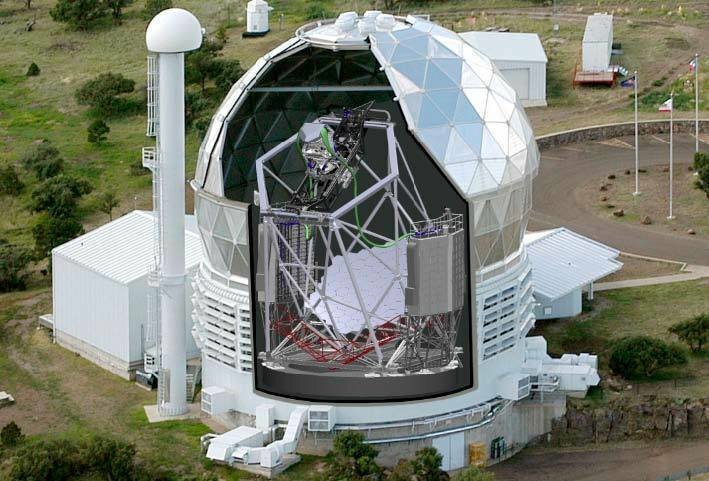 Work is underway to modify the telescope for the upcoming Dark Energy Experiment (HETDEX). The addition of 150 integral field spectrographs (VIRUS), mounted to the sides of the main framework, will give the HET the ability to map the expansion rate of the early universe, looking back in time billions of years, to measure how clusters of galaxies moved in relation to one another as the universe evolved. 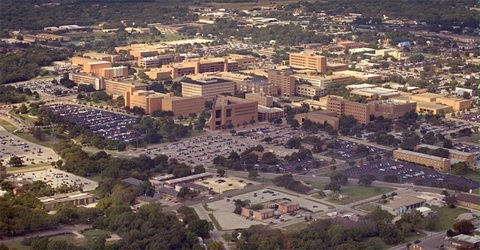 The Wide Field Upgrade (WFU) is the first phase of the HETDEX retrofit. Keep up with progress at HET Blog, a forum where users can post articles, comments, and photos of the work. Time-lapse movies and live webcams are available at HETDEX WFU. Artist’s concept of the upgraded Hobby-Eberly Telescope. The VIRUS spectrographs are contained in the curved gray “saddlebags” on the side of the telescope. The deployment of the Visible Integral-field Replicable Unit Spectrograph (VIRUS), for the HETDEX project, will transform the HET into a powerful survey instrument like no other in astronomy, placing 35,000 fibers on the sky, each capable of collecting a distinct spectrum, with every exposure. VIRUS is scheduled to begin science operations in 2017.